Numark, creator of the first 100% digital DJ mixer, continues to develop digital mixing with X5. This two-channel, 24-bit, high-resolution mixer contains high-end analog-to-digital and digital-to-analog circuitry and powerful look-ahead limiters at the master, booth, and headphone outputs to deliver virtually lossless, clip-proof audio performance. I took tested the Numark X5 to its limits for the complete written review INSIDE! The Numark X5 Mixer is the newest two-channel Professional Scratch Mixer developed by the Numark DJ Division to be a perfect match for the super-popular Numark V7 Digital Media Controllers. Even though the Nuamrk V7 controllers can work with any mixer out there, the Numark X5 is literally made to sit perfectly next to the V7’s. The last few Numark Professional two-channel scratch mixers (The DXM-Pro and the Pro-SMX reviewed right here on DJbooth.net) were both well-made and definitely worthy of any scratch DJ Setup. 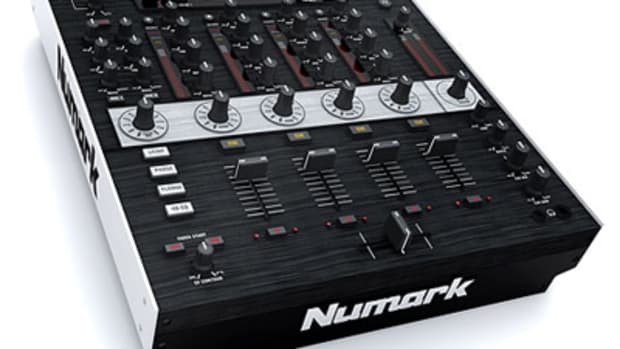 Numark looks to continue this winning streak with the introduction of the Numark X5 Mixer. The styling cues are obviously taken straight from the Numark V7 and Numark NS7 series. The Numark X5 has great looks with the nice silver rough metal on the side and bottom panels with black brushed aluminum finish over the entire top panel of the unit. The Front of the mixer has a shiny metal overlay with a big (but cool) raised Numark Logo. This thing is built super-tough just like the Numark V7. It’s heavy overall and feels like it will take years and years of abuse and use. This is definitely a High-Quality piece from Numark. The setup of the Numark X5 was pretty straight forward. I simply plugged in the power cable, and connected my left and right RCA cables of each deck to the appropriate channel Line/Phono inputs on the back of the mixer. I then connected the RCA master outputs to my amplifier and I was ready to go. At this point I usually set my Crossfader and Linefader curve adjustments to the appropriate contour using the sturdy and rubbery knobs found on the front of the mixer for the Crossfader and on the top of the mixer for the Line Faders. The Crossfader is set all the way to the right for the sharpest setting allowing for the quickest cut. The Linefaders are set to the halfway point when fade scratching and set to its sharpest settings when I want to cut using them. As I set up this mixer, I immediately found an issue that was not anticipated. The height of the Numark X5 mixer is shorter than that of my normal decks. 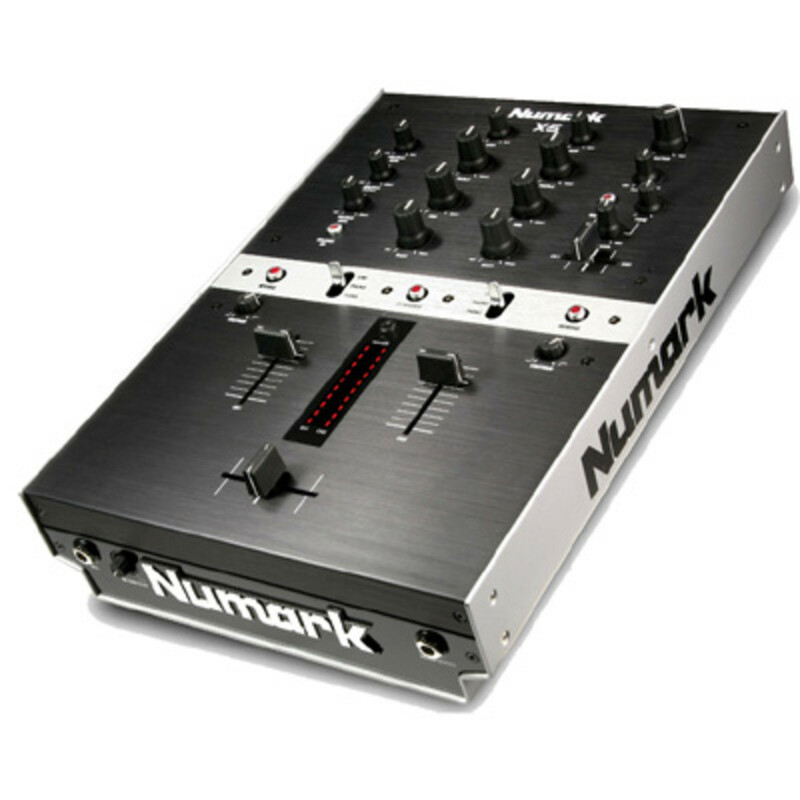 The height of the X5 is made to be exactly the height of the Numark V7 media controllers which is actually about an inch and a half lower than all other standard decks and mixers. This isn’t really a deal-breaker for me, but definitely something I have to get adjusted to. – The Numark X5 is a 24-bit, high-resolution mixer that contains high-end analog-to-digital and digital-to-analog circuitry to ensure the sound quality is not compromised. 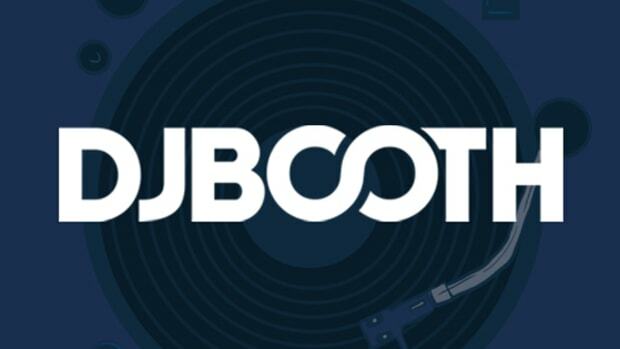 The Master, Booth, and Headphone outputs have limiters so that the DJ has clip-proof audio performance. It is true that the Numark X5 has VERY good sound quality. I am no audiophile, but everything coming out of this mixer just sounds crisp and as good as the source material would allow. This mixer definitely had a better sound than other mixers on the market at similar or higher price-points. I am more than satisfied with the sound quality exhibited by the Numark X5.
. The Crossfader has the rubbery curve adjustment knob on the front of the mixer and the line faders have the rubbery adjustment knob at the top of the faceplate. Each of the adjustment knobs can be micro-adjusted to give the user the best possible setting for their scratching needs. After the settings are just right, the DJ can then press the fader curve adjustment knobs into the outer shell of the mixer so that the knobs are recessed out of the way which makes it harder to accidentally re-adjust the curve settings while performing. The actual faders themselves have smooth plastic caps that don’t feel harsh over a long period of scratching-time. The faders worked FLAWLESSLY through the 30-days that I have been using the unit. I even invited my brother over to put the mixer through its paces and he was thoroughly impressed. This mixer took everything we threw at it with stride. When we test these scratch mixers, we really put a beating on them to try and find the limits; and like other high quality scratch mixers, the Numark X5 screamed at us for more. The Cuts were very accurate and precise on the sharpest setting. Fades were very smooth and long when the curve adjustment was at the gradual setting. The Crossfader and Linefaders were identical in performance. Every scratch I could do on the crossfader, could also be pulled off on the line faders. The faders feel like they have very little or no resistance in them making it easy to pull off the strenuous fast-cut combinations necessary in today’s turntablist environment. The faders really feel like they will last a very long time. Some users would like a Pro-X-Fade or Innofader for ultimate crossfader adjustment and control, but I can honestly say that I would be completely satisfied with the CP PRO faders that already come bundled in the Numark X5. The cut-in time was VERY small even when compared to other Professional Scratch mixers. The cut-in travel distance was about 1mm making it simple to do advanced crab and transformer scratches. No word as of yet if this mixer can actually accept those other professional crossfaders. Please contact your local fader supplier or manufacturer for compatibility information. Each fader has its own dedicated silver reverse button which is illuminated after it is pressed, so the DJ can see at a glance if anything is in “reverse” mode. They are all located in the middle silver panel of the mixer front for easy access. The Transformer switches on the Numark X5 also worked flawlessly during our tenure with the mixer. The switches can be set to either phono or line, or the TRANS function. The switches are spring-loaded for the TRANS function which bounces the switch back into the phono position for quick and easy transformer scratches. – All of the knobs on the Numark X5 are made of a plastic-rubbery type material that is smooth to the touch and have a nice level of resistance to ensure the DJ is getting the exact setting that is required. The EQ and Master Volume knobs are a bit bigger than the rest so the DJ will know what is being adjusted by the touch. All the knobs worked exactly as expected with no bleeding or popping during any adjustments. – The Cue/Headphone area of the mixer has a channel-one to channel-two small fader which allows the DJ to monitor both channels at the level necessary. Above the small fader is the Cue Gain knob or volume control for the headphones. Along with this, there is a TONE knob so that the headphones bass/treble can be adjusted. Lastly, there is a Cue/Master button which is illuminated when pressed to show the DJ is in Master Monitoring mode. The DJ merely has to press the master button to hear what is being played out the Master output. In between the faders, there is an LED strip which can be displayed in Left/Right output or CH1 and CH2 output on the respective side. – There is a 3-Band EQ for both channels of the mixer. There is Bass, Mid, and treble oversized knob controls right where they should be. All of these EQ levels can be adjusted to complete Kill which we all happily used while we were searching for cool alterations to our overused scratch sounds. Above the EQ knobs is a regular sized gain knob which is used to ensure that both channels are playing at the same level. The Microphone and AUX section of the mixer is on the top-left. These controls are shared by the Microphone input or the Auxiliary input. There is an illuminated button which the DJ can use to switch between AUX or MIC depending on which one is needed at the time. There are separate knob controls for the BASS, Treble, and Gain (Volume) parameters of the AUX/MIC section which all worked just as it should. – On the very front of the mixer, there are ¼-inch inputs for the Headphones and Microphone. Around the back, there are ¼-inch Balanced Outputs, a Digital Coax output, and optical output, Master RCA output, and a Booth RCA output. For the inputs on the Numark X5, there are Channel one and Channel two PHONO/LINE RCA inputs which can be switched to either Line or Phono depending on the equipment being connected. There is also another LINE input for each channel meaning each channel can have two Line inputs if necessary. Also included on the back is another Auxilary input which can be used for other audio sources such as an IPOD or CD player. 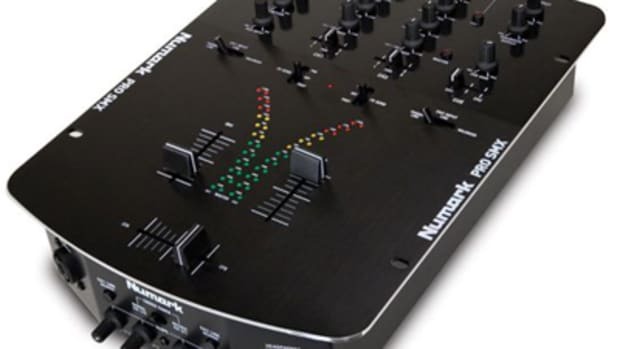 At the end of the day, Numark has created one heck-of-a two-channel Professional Scratch mixer. Considering their last two efforts (DXM-Pro and Pro-SMX), I was very confident that Numark would produce yet another high-quality scratch mixer with excellent fit and finish without leaving out the most important features. Numark has definitely succeeded with what they have set out to do with the X5 mixer. The faders are all very good and the adjustments were more than enough for me and my scratch team. The only real gripe I have with this mixer is that the height of the mixer is shorter than all other decks/media controllers. The mixer sits about an inch and a half lower than my non-Numark Decks. This mixer was designed to fit perfectly with the Numark V7’s and this is why the height of this mixer is shorter than the others. I can easily recommend this mixer to any turntablist or any DJ who only needs two channels for their mixing needs. Any DJ with a set of Numark V7’s should DEFINITELY purchase a Numark X5 because they are simply a perfect match in color, height, and just about every other aspect imaginable. Coming in at the $450 US price-point, they offer a high-quality and sturdy mixer that will last a long time and still be able to perform in the same arena with the other top-rated battle mixers.